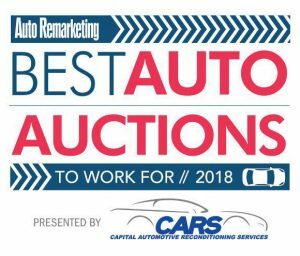 FRANKLIN, TN – Dealers Auto Auction Group had 4 locations honored as part of the 2018 Auto Remarketing’s “Best Auto Auctions to Work For”. DAA Murfreesboro, DAA Huntsville, DAA Chattanooga and DAA Mobile were identified as companies that have excelled in creating quality workplaces for employees. This survey and awards program are designed to identify, recognize and honor the best employers in the auto auction industry, benefiting the industry’s economy, workforce and businesses. The list is made up of 34 auctions. The 2018 program is sponsored by CARS Recon, Inc., offering reconditioning services for the auction industry since 2003. The first part consisted of evaluating each nominated company’s workplace policies, practices, philosophy, systems and demographics. This part of the process was worth approximately 25 percent of the total evaluation. The second part consisted of an employee survey to measure the employee experience. This part of the process was worth approximately 75 percent of the total evaluation. Dealers Auto Auction Group, which is a part of the AMS Auction Network that represents 24 independent auctions across the country, was started back in 2001, with their first auction in Horn Lake, MS. There are now 7 auctions in the Southeast including Dealers Auto Auction of Chattanooga, Dealers Auto Auction of East Tennessee, Dealers Auto Auction of Huntsville, Dealers Auto Auction of Jackson, Dealers Auto Auction of Memphis, Dealers Auto Auction of Mobile and Dealers Auto Auction of Murfreesboro. For more information please visit www.dealersauto.com.